Showing 22 articles from September 3, 2013. 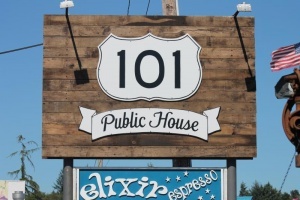 Photo by Sally Kunke Stop by 101 Public House for a quality meal and much more. SOUTH BEND – The 101 Public House in South Bend is open for business — come on down for fresh, all-natural and locally produced food on the bay! 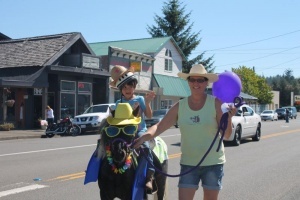 Photo by Sally Kunke Claire Jones rides Elmer during the Kiddie Parade Saturday afternoon at the 51st Annual Come & Play on Labor Day celebration. Claire won second place. Lunch is G-R-E-A-T! 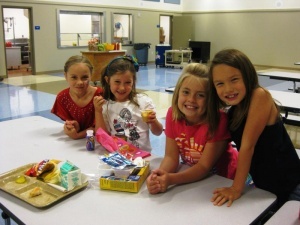 Photo by Kayla Camenzind These second grade girls enjoyed their lunch in the new cafeteria at Willapa Elementary last Wednesday. MENLO – The remodel of the Willapa Valley Elementary was finished this month, just in time to welcome back 150 elementary students. The project began in August 2012, requiring one year to be finished at a budget of approximately $1.6 million. Photo by Kayla Camenzind Residents of the Tokeland/North Cove/Grayland area attended the meeting with the Pacific County PUD to discuss the transfer of service from Grays Harbor PUD to that of Pacific County last Tuesday (August 27). 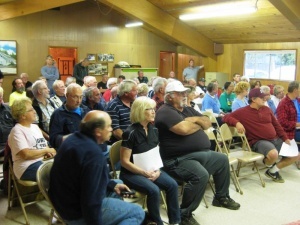 Residents of Tokeland, North Cove, Grayland and other areas across Pacific County met at the North Willapa Grange last Tuesday (August 27) to discuss the extension proposal with Pacific County PUD. Many Pacific County residents who are currently being served by Grays Harbor PUD voiced concern over the proposal. 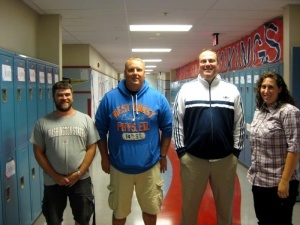 Photo by Kayla Camenzind From left are the new teachers at Valley Keith Fraiser, Jon Pearson, Colby Rogers, and Molly Majors. MENLO – The Willapa Valley School District approved the budget this year at $4,053,022 with a predicted enrollment of 295 students. New funding to the school will pay for full-day kindergarten, leaving more money in the general fund for other improvements. Those seeking out local family-friendly events can look forward to the Southern Washington Mineralogical Society’s rock and gem show later this month in Castle Rock. Held Sept. 21 and 22 at the Castle Rock Fairgrounds, the show will be free to all who wish to attend and features geological spectacles on display as a special "Gem Dig" for kids and door prizes every half hour. Each year Centralia College welcomes international students from around the globe. For many of those students, living with host families is their first choice. That living arrangement increases understanding of diverse cultures for both the student and the host family. There is an urgent need for host families, especially in homes within walking distance of the campus. More than 300 parents and students turned out for an open house and BBQ at Winlock Miller Elementary School Thursday night. 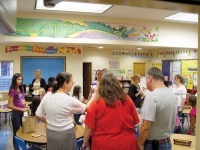 Though an open house is usually held each year, Superintendent Shannon Criss said this is the first time free dinner has been available at the event, provided by volunteers with the Parent Teacher Student Association (PTSA). Toledo residents are gaining a clearer view of how the new Valley View Health Center clinic will look when it is completed. The building, which has been under construction since May, is intended to replace the aging Valley View facility currently in Toledo through the help of a $644,000 federal grant. It has most recently gained a metal roof as exterior construction draws to a close and remains on track for completion Oct.25. One of the things I’ve heard about weather in the Pacific North West is: "Whenever summer begins, it will last three months." So-o-o- by my reckoning, our dry and hot weather began in early June this year and now it’s early September. I bet they can’t prove that on "Mythbusters"! Most notably, there has been a measurable amount of rainfall recently, which has the yards expressing their gratitude with some brighter green grass. The rain has also increased our humidity, which is a bit of a change. Meanwhile, I heard some geese calling one night (are they getting ready to move on?) and have seen the first nuthatches and chickadees of the fall season. The Cat’s Meow SNAP! reports overwhelming response. Your support is appreciated. Local low-cost services include $29 male kitten neuter at Chehalis-Centralia Vet Hospital, (360) 748-6622 and $30 feline leukemia test at Sparling Vet Clinic, (360) 748-8161. Friends of the Toledo Library gather forces to get this measure on the ballot in October. Contact Bill or Pat, CALDWELL@toledotel.com or (360) 864-6757. Join the Club! Well, I’m tired. I just got back from visiting Eastern Washington, and I spent a good portion of the last three days trapped in a car with four grumpy kids. I’ve earned my exhaustion. Don’t forget to drop on by the new shop on First Street called Adriana’s Lost and Found. It’s right across the street from the Trading Post, and they’re due to have their Grand Opening this weekend! For more information, please contact the shop’s owner at (360) 523-3315. 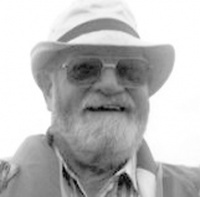 Richard Guenther passed away on August 21, 2013. He was born on June 7, 1932 to Sylvester "Boise" Guenther and Olive Leona (Castellion) Guenther. Richard married Mary Brunner 59 years ago on April 24, 1954 at St. Francis Mission, Toledo, Washington. He was a 1951 graduate of Napavine High School. His employment career consisted of 42 years driving milk truck, or as he called it tricycle fuel. P.U.D. No. 2 of Pacific County heard comments from State Auditor representatives during an Exit Conference on Monday, August 19th (at the Raymond PUD) for the 2013 review of the District’s 2012 business. The City of Castle Rock may be facing some tough financial decisions after receiving news their local branch of Heritage Bank, where the city is a customer, will be closing. Mayor Paul Helenberg brought the issue to the attention of the City Council during their Aug. 26 meeting and said, when the bank does close, the city may have to commute to a nearby branch or find a new bank entirely, as there would be no other banks left to do business with in town. Winlock Lions Club President Bob Giardina opened the public comments with a clarification regarding concerns of adversarial actions between his club and the American Legion following last meeting's early approval of community building room rental for 2014 fund raising. "There is no animosity between the Lions Club and the American Legion," he declared, "and we are discussing collaborative projects in the near future." 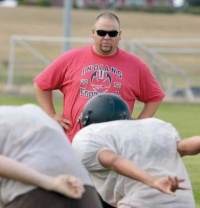 With the beginning of school also comes the local high school football season. All three area teams will begin their 2013 campaigns this week. Toledo will be the only team on the road as they begin in Stevenson. Head Coach Jeremy Thibault says that he has a small senior class, but has a good number of athletes available. Three local teenagers survived a collision which totaled all of their vehicles near Winlock Aug. 27, according to the Lewis County Sheriff’s Office. Specific details were not readily available, but it was reported a 16-year-old female had stopped to turn left into the High School parking lot on the 200 block of N. Military Rd., when she was rear-ended by a second vehicle, which was then struck by a third vehicles. The Department of Health has eased concerns among local emergency aid agencies by stating they do not need a minimum of two medics when responding to a scene, only for transporting a patient. The issue had been raised among officials during the Aug. 20 meeting of the Lewis County Medic One Interlocal Board, at which time Board Member Randy Pennington, with Lewis County Fire District 15, said his district had directed EMTs to not dispatch their ambulance until a required two medics were on board. Local law enforcement are attempting to crack down on those responsible for a recent rash of burglaries in the South Lewis County area. Lewis County Sheriff’s Sgt. Robert Snaza said he is coordinating with the police departments in Toledo and Winlock to help share information and track down leads as they continue efforts begun last year to focus on property and drug crimes in South County. As summer is drawing to a close, shorebirds are anticipating the season's change. Tens of thousands of them - sandpipers, yellowlegs, dowitchers and other species - are already flocking to Washington's coastal areas en route from their Arctic breeding grounds to points south. Clouds of shorebirds, especially sandpipers, can now be seen from Ilwaco to Ocean Shores. Unlike their spring migration, shorebirds' flight south is a disorderly affair. Adults often leave the Arctic before their chicks are fledged and join flocks departing at different times. They also travel at a more leisurely pace, departing as late as October. Rare birds, such as off-course Asian shorebirds, are more likely to join the others in their southward flight than on their trip north.